Nineteen fifty-nine was a year of great uncertainty. What about the Russians? Why so many TV Westerns? But in Stuart Nation, Philadelphia’s West Oak Lane neighborhood, I tripped over my own vexing questions like they were too-long shoelaces—all swirling around a girl in my fourth-grade class whose disinterest intoxicated me. I was a happily-chatty kid most of the time, except when I was around Carol, whose studied cool and blond, bowler-cut hair usually left me incapable of saying more than hello. To the actual Carol, that is; I shared some incredible phantom-afternoon interludes with the imaginary one at home after obsessing over the real deal all day at F.S. Edmonds Elementary School. Borderline prodigy psycho? Maybe—but this isn’t your story, it’s mine. So here goes. 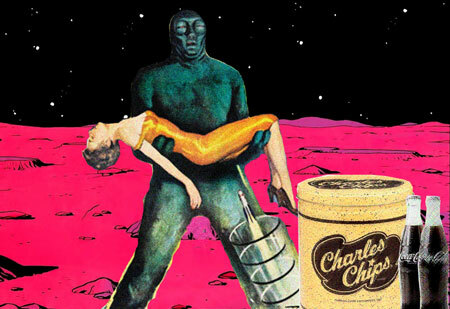 Our day-dream dates would begin with me opening a Charles Chips potato-chips can and yanking out two salty scoops, one destined for my spot at the dining-room table, the second for my father’s hallowed nesting-place. “These sandwiches will look weird,” I’d address dad’s setting, now hers, “but wait ‘til you taste them!” I’d toast two Freihofer’s bread slices and set them aside; the last two would be Carol’s. I wouldn’t mind my toast a little bit cold—she wouldn’t get the full genius of this without Total Heat. After the second toasting, I’d theatrically grab the hot slices and put them onto a red plate (“Hope you don’t mind plastic”) and reach for the peanut butter. I’d glob the brown oily mess onto all four slices, bring them to the table, and crumble the chips, first Carol’s, then mine, onto one slice per plate, then smoosh our sandwiches together. “You are gonna love this!” (At this point I envisioned her blue eyes dancing.) I laid my sandwich onto a blue plate and went to the fridge for Coke, breaking, then dropping, ice into two plastic tumblers and beaming toward her setting. “This will wash it down just right” I’d return to the table, gobble both sandwiches and down our drinks. Then I’d clear the table, plop down at my spot and look at hers, where I pictured her grateful smile straightening my crookedest grin.